Do you remember your very first tango class? We’d spent an hour walking, alone and in the embrace. Because Tango couldn’t be only about walking, could it? Where was all the fancy leg work I’d seen in TV tango shows? And where were the young hot male partners who would sweep me around the dance floor?!? And she wrapped her arms around her body, with closed eyes and a big smile. Still, I came back the week after, and I was right to do so. Today in classes, I’m the one telling students that it’s about the walk, the walk, the walk, the walk! Because really, she had a point. Nothing beats a powerful, relaxed, elegant, musical Tango walk. Funny enough, the feeling you have, as a follower, when you are walking with a good dancer is probably exactly what I was hoping for when I first started and expected all the fancy turns, jumps and kicks. It’s a feeling a being taken into something much bigger and more beautiful than yourself. So in our classes we always focus on making sure our students can walk beautifully. That’s why when we filmed our online course we spent some time filming videos on the walking technique. In this video, Pablo and Naomi give tips for a powerful and elegant walk. They talk about axis, weight, projection, how and when to land… They’re great teachers and amazing teachers, so for beginners or intermediates there is a lot to learn from their tips! Once you’ve had a chance to watch, we’d love to hear from you. 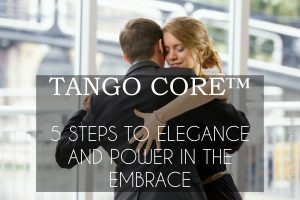 Do you have any tip you can share, for leaders or followers, about walking in the tango embrace? We’d love to hear your perspective! PS: if you, that teacher, ever read this article: thank you for making me walk so much! Why does it feel so good to dance with Argentinian people? This was a surprise but nice because it dealt with concepts and an overview while at the same time being very specific. I think, because I dance several dance styles and am from the US, find that looking at the differences between walking in one dance and another have helped me understand that I want markers that remind me as I go from say Balboa Swing to Tango that the latter likes to mark the collection point, mid-foot on walks. When I do that I over-ride the muscle memory two-stepping right through it and for me it is the beginning of feeling the song. Hi Rich, I agree that dancing other dances can both be very helpful and very confusing in Tango… until you’ve understood the technique well enough to make both your own! Excellent! Very precise and easy to follow. It is always good to go back to the beginning again, if only to correct oneself. We all get into bad habits!! Thank you, I look forward to the next. Thank you! We’re glad it helps!! I am impressed by your article on Balance and Core. Where are your classes in London please? I am a not very good Tango dancer and find it hard to have a partner if I go out to a Milonga – DOB 17/11/37 so not surprising though I look younger for my age and am active dancing other Latin American dances, eg. Bachata, Cha Cha, Salsa! my tel. no. is 07932 497709 (M) and 020 8441 7432. I live in New Barnet. Thank you. So glad i bought this wonderful course. Extremely clear and precise explanations from Pablo and Naomi and beautifully put together. I especially enjoyed The Walk and Connection lessons, made me re think a few things. Really good idea to go through the course 2 or 3 times,its interesting what you pick up 2nd time round. Well done and i look forward to your next on line course.